Meanwhile, “cautious optimism” about Uzbekistan and a quick lesson on Soviet history in the region; weekend reading. Kyrgyz-Kazakh Rift: This week the Kyrgyz parliament adopted a proposal to formally reject $100 million in aid from Kazakhstan. Bruce Pannier called it “an ‘own goal’ of epic proportions.” Why has Bishkek rejected “essentially a gift given to help Kyrgyzstan update state entities to meet EEU trade standards”? Pride, mostly. Kazakhstan tightened border control on October 10 after Kyrgyz President Almazbek Atambayev started flinging around accusations that Astana was backing Omurbek Babanov, the main competitor to eventual winner Sooronbai Jeenbekov (from Atambayev’s Social Democratic Party). 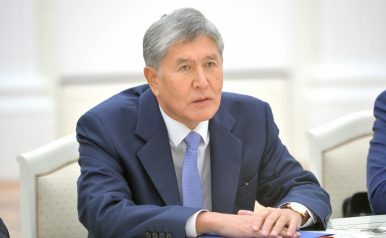 Atambayev, in typical hot-headed fashion, both subtly and outrightly insulted President Nursultan Nazarbayev and Kazakhstan in interviews and his UN General Debate speech. Just this week he said, of the Eurasian Economic Union, “A union that depends on the whims of one person, no matter how great that person is, cannot be solid.” The one person is assumed to be Nazarbayev, given the current kerfuffle. As Nurjamal Djanibekova wrote for Eurasianet this week, diplomatic talks continue and while there has been some improvement in pace at the border, things are far from normal. If Atambayev’s mudslinging was a political tactic, it has smeared his successor too and set up a headache for the Kyrgyz people. The Kazakh-Kyrgyz rift continues to widen as Atambayev's presidency wanes.